How about add bounty boards in the villages? That's definitely coming in the future. An excellent idea! I quite like the look of this mod, although I am hesitant to make use of it myself just yet. • Add a mining time to the block. Instant breaking is pretty jarring. • Create an alternative board that you can hang on the walls, as opposed to replacing a wall block with it. • It seems to eat bounties if you try to put them back into the board. I'm not sure if this is intended, but it seems a bit odd and might confuse people who don't know exactly how to turn in a bounty the first time. My biggest complaint is that you can have unlimited bounties. There does not seem to be a shared pool bounties are pulled from and even the same empty board can be refilled instantly by breaking the block and replacing it. I would very strongly recommend creating a global pool of bounties (or multiple pools for people who want different bounty offerings in different locations, with the ability for an op to decide which pool to pull from per board) that the boards are assigned to to prevent unlimited bounties. The mod feels very easily exploited unless the bounties are placed in protected areas and only spawned by ops, and if that is intended purpose, then I think at the very least the default config should include an option to disable the recipe. Alternatively, freshly placed bounty boards starting with no bounties at all is also a solid option, although I still feel having pools to pull from is the way to go if players can create an infinite number of boards. I would probably remove the recipe and turn bounty boards into rare drops otherwise. Great mod though, I'll be keeping a close eye on its development! Mining time - good idea! 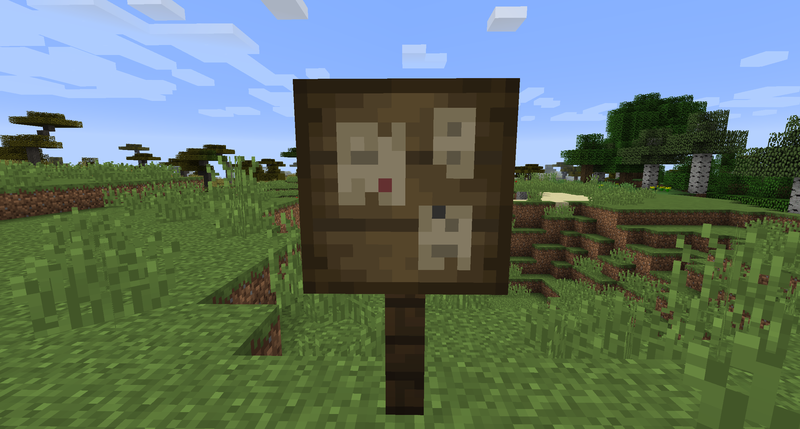 Alternative board for walls - I'm actually considering making an alternate version that uses the Sign model. It does eat bounties that get put back - with the idea that if you are putting it back, you didn't want the bounty and it should be removed. I'm open to changing that, depending on what people say. If you right click in the air with a bounty, it should also tell you how to turn in the bounty. If you don't have all the items required, it will tell you that instead. 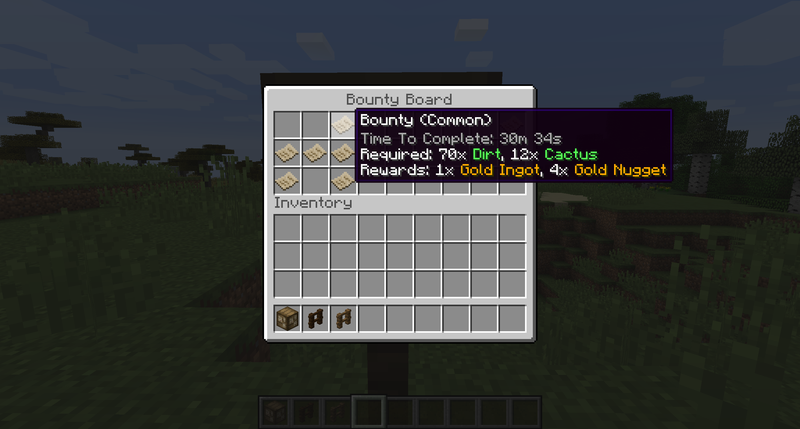 Yeah, currently if you place down a bounty board, it populates the board with half of it's max number of bounties. My only problem with making it 0 bounties by default is that it might confuse new players. They will just place the bounty board and won't see anything inside of it. I could change this to a config option, so that you can configure the default that show up when placed, and make the default value something smaller such as 2. I could create an option in the future to disable the recipe, yeah. Currently you can easily do so with CraftTweaker, though I do see the appeal in doing so with just the config. If you want to talk more about it, Ejektaflex#4616 on Discord. 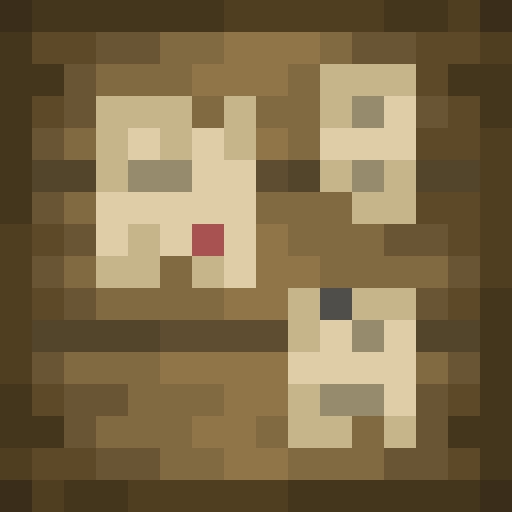 What if someone used this in a modpack as an 'order' system? You'd have work on producing different things like tool parts and crafting products and hand them in to get money for raw materials, with rarer bounties being orders for more complex items. Could be fun - perhaps it could be done without any automation as well to start with, and then later on you'd go from (say) working metal into tool heads to casting them in a foundry and then creating a fully automated system. This is a f***ing awesome idea. Request, could you add player added bounties, in which they request items A or ask for mobs A to be slain in exchange for whatever reward they set? That's actually the #1 thing that's been floating around in my head, yes! Wooo!! It's too good of an idea not to do it! For the time being, you could always turn in the mob's drops (rotten flesh, gunpowder, etc...) to collect the reward. Yeah, mob drops seem like the best way for the time being. Mob bounties will come in the future!